Break the Christmas Color Code! Lifestyle Editor at BROADWAY+THRESHER Magazine. Lisa is also the proprietor of the vintage boutique Urban FarmHouse in Thornville, Ohio, and has been selected as one of Romantic Homes magazine's 'Romantics' design & style leaders. Lisa is sharing some fresh 'new country' decor inspiration with us, to show us how unexpected color choices in our Holiday decor can bring BIG results... enjoy! In my dining room, I let the cupboard choose what "dress" she wanted to put on for the party this year. While her main color is a sea foam green, she has many layers. 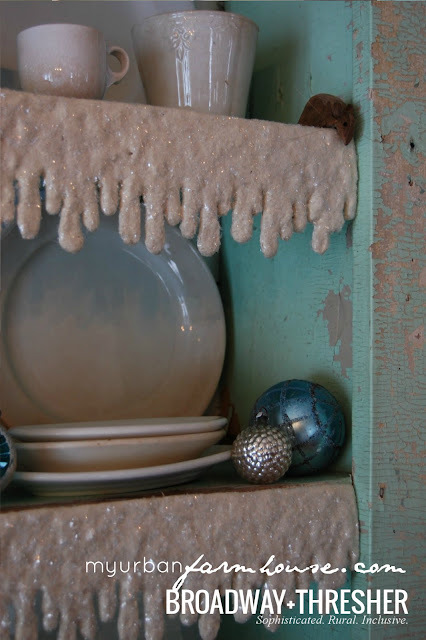 Gray, teal and cream all can be seen peeking out here and there so it was decided: silver, faded blues & greens, tarnished glitter and "dirty" ironstone. This fabulous cupboard is dressed quite simply for the season's soirees. 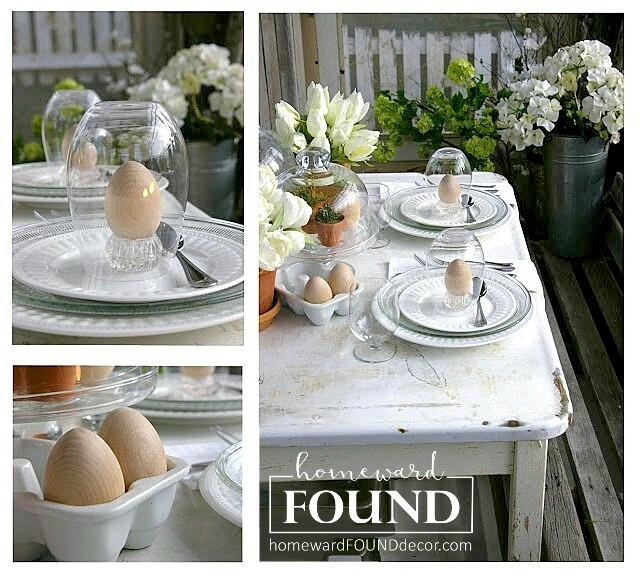 Plates and bowls are still available for use without being buried (and make your everyday items serve double-duty as decor! 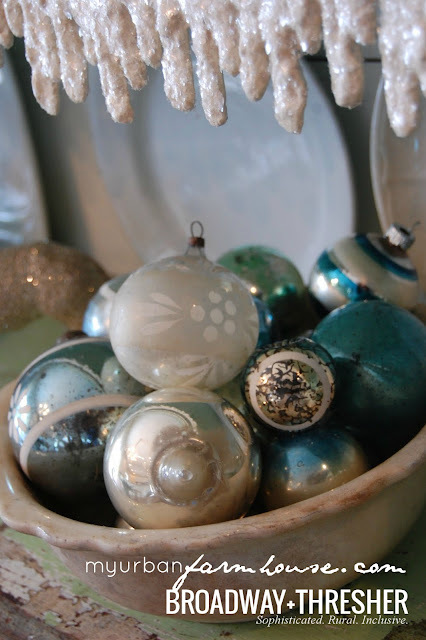 ~ Deb) Gather up your collections of ornaments to fill up your bowls and tureens. It's quick and easy. 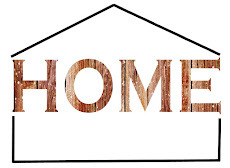 You'll be ready for the shopping, baking and entertaining in no time! 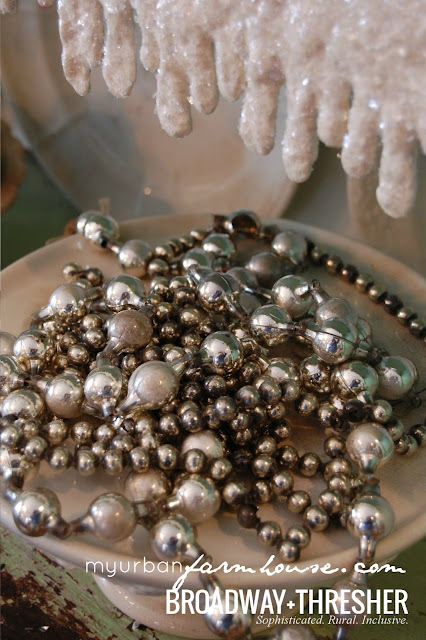 Pieces of drippy, mica dusted snow add the crowning touch, like the icing on a cake! 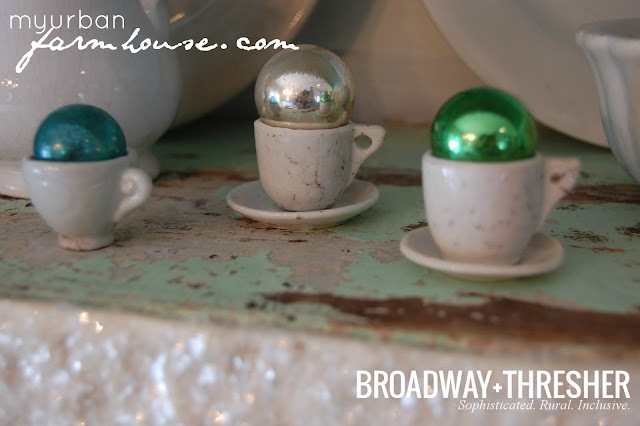 Don't pass up those pieces of ironstone at your favorite haunts just because they don't have a lid! 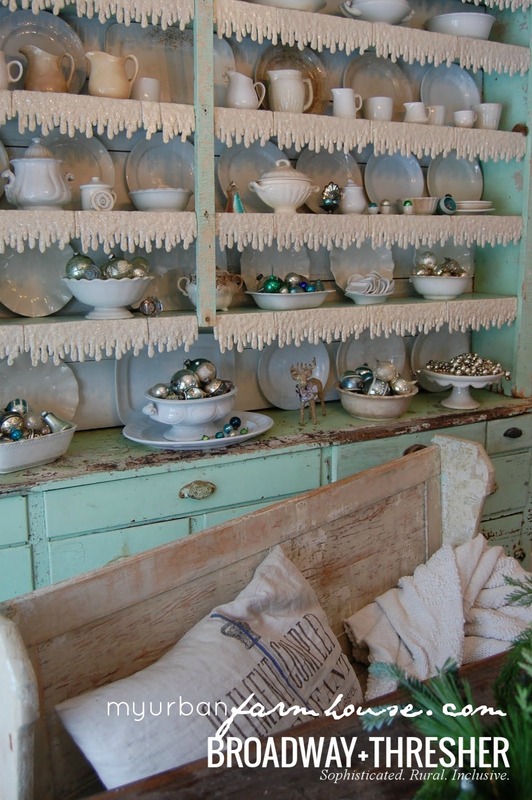 Rustic and well-loved ironstone bowls are overflowing with heirloom ornaments in shades of blue, cream and green. 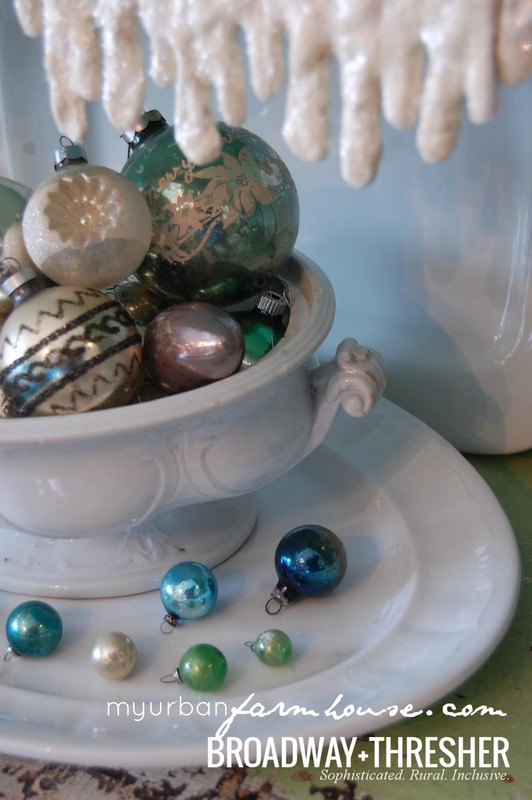 Petite ironstone teacups serve up sweet treasures: They are perfect for holding a vintage feather tree glass ball. Grouping like colors together makes a collection stand up and get noticed. 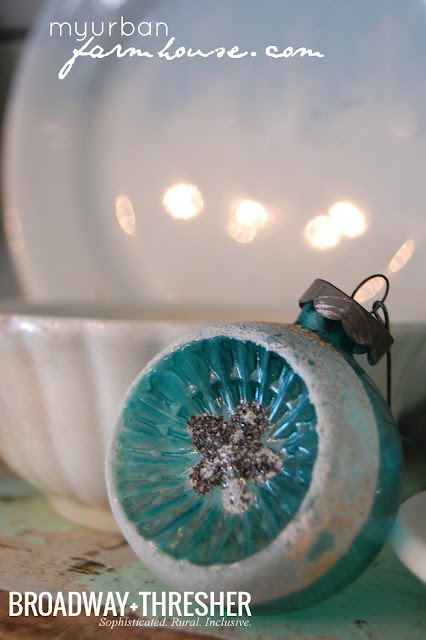 Even a cast off glass door knob becomes a festive bauble. A lone (but stylishly glittered) deer stands guard over a single vintage ornament. Thank you, Lisa! 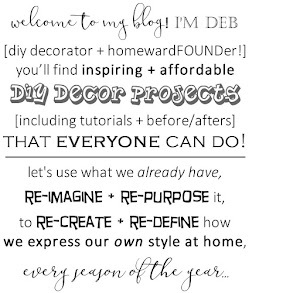 Such great inspiration for the Holidays! Absolutely gorgeous! That is a nice change. 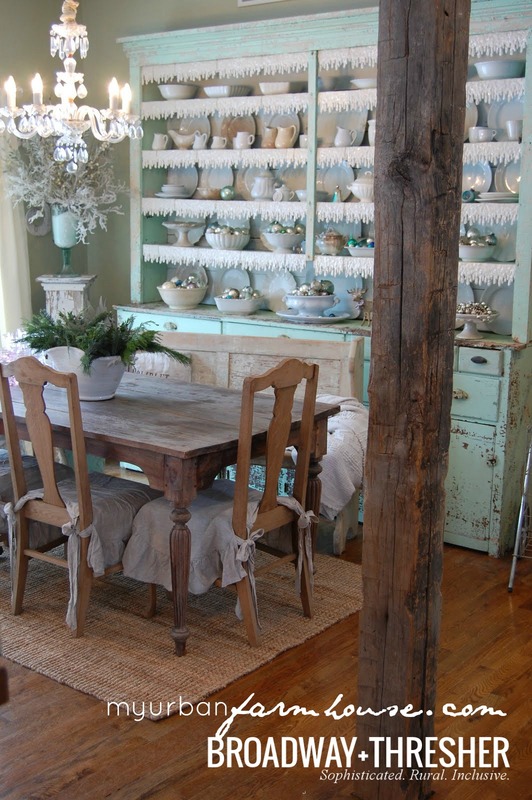 Loving all the vintage touches, perfectly charming! So, so pretty. I love this so much I can hardly stand it. 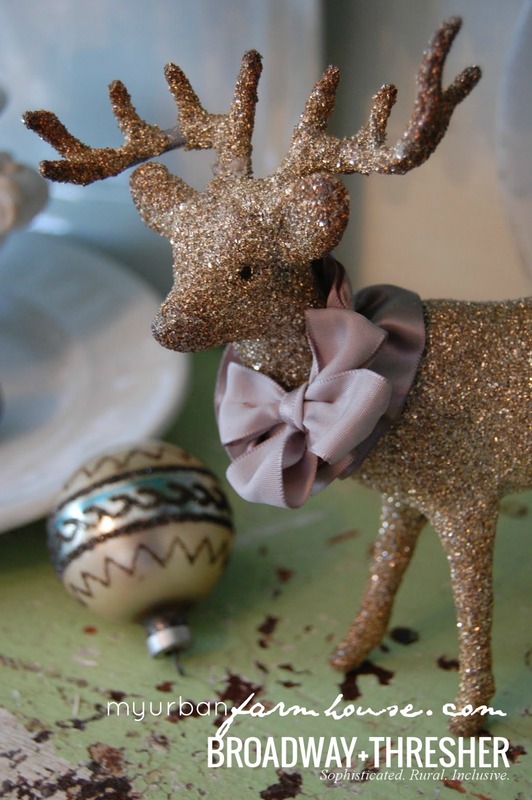 The little glittery deer stole my heart. Love,LOVE this color combination! So beautiful! 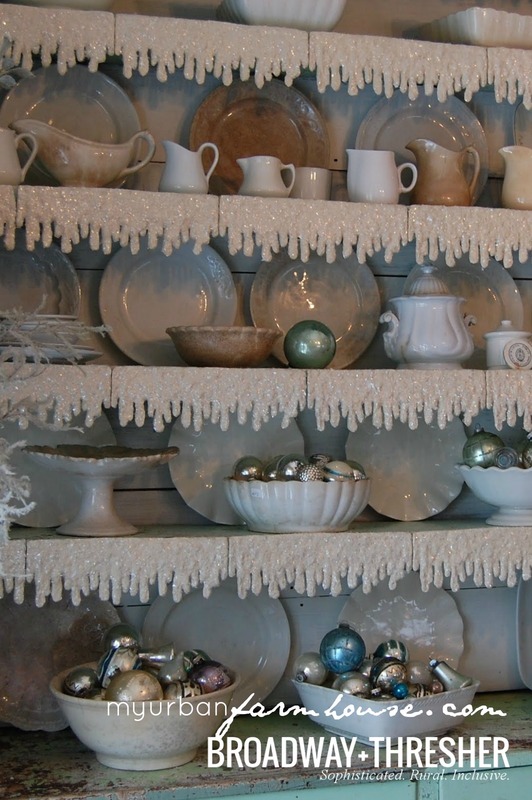 I just want to reach in the screen and swipe all those fabulous vintage ornaments!!! Love the entire feel of the room. It's fantastic. Wow! How beautiful, that icy color and each ornament and accessory. Must take another look at my colorful house and see if I can introduce some of that look here. Warm Up With a Scarf Wreath! 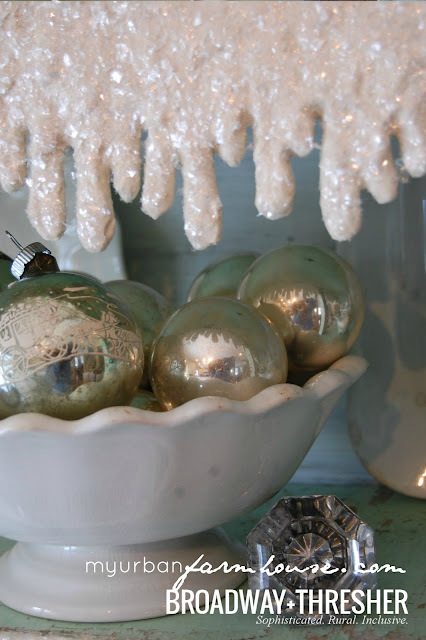 Fresh & Green Holiday Decor Ideas! fall tablescape: spice it up!